I'm very fussy when it comes to choosing my skincare products and very rarely repurchase the same product twice, however, I have been a loyal user of Garnier Micellar Cleansing Water ever since its release. Before, I flitted between makeup wipes and cream or toner makeup removers. Since falling in love with Garnier's Micellar Water I haven't gone back and have repurchased it more times than I can count, I honestly don't think I have loved a product as much as this one in a very long time. Using makeup wipes have not felt the same since I began using Garnier's Original Micellar Water and I truly realised how little makeup comes off when you use wipes, it doesn't even begin to scratch the surface of the makeup that is embedded in your skin. When I saw Garnier had released their SkinActive Oil-Infused range, I was excited and intrigued. I really like that Garnier are being more innovative and releasing products, which are different to what is currently on the market. The SkinActive Oil-Infused range consists of a Micellar Water and Cleansing Wipes, perfect for removing makeup, impurities and dirt, leaving skin visibly smoother and refreshed. Not being an overall big fan of makeup wipes, I was somewhat torn over whether to buy the Garnier SkinActive Micellar Oil-Infused Cleansing Wipes, but decided to give them a whirl in the end. Makeup wipes are generally quite expensive to begin with, unless you get the £1 Superdrug or Boots own brand. These cost £3.26, which is an average price for decent makeup wipes. Despite my initial reluctance, I am glad that I went against my judgement and bought the Micellar Oil-Infused Cleansing Wipes. They were fantastic for removing impurities, leaving skin feeling smooth and smelling incredible. They worked well beyond my expectations and was great for removing an initial base of impurities, I paired it with the Micellar Cleansing Water afterwards to ensure my face was properly cleansed. The Garnier SkinActive Micellar Oil-Infused Cleansing Wipes are the best makeup wipes I have tried, but cannot justify spending £3.26 ever month when my Micellar Water does the job in the first place. Plus I'm too attached to the original Garnier Micellar Water and I don't think it will ever be knocked off of the pedestal it is on in my mind. Being a big fan of the original Garnier Micellar Water, I was looking forward to trying the Garnier SkinActive Oil-Infused Micellar Cleansing Water and despite not having ran out of my current one yet I bought it anyway. It costs £5.99, which is reasonably priced and I have been using it for weeks now without barely making a dent in it. The Oil-Infused Micellar Water is very nourishing and removes dirt/impurities from the skin, leaving oils to sink in and hydrate your face. It's a very weird sensation once you have cleansed your face and it feels kind of heavy with the oils on it, but once it penetrates the skin your face is left feeling refreshed and healthy. It does take some getting used to and feels really strange to begin with, but it is really great. 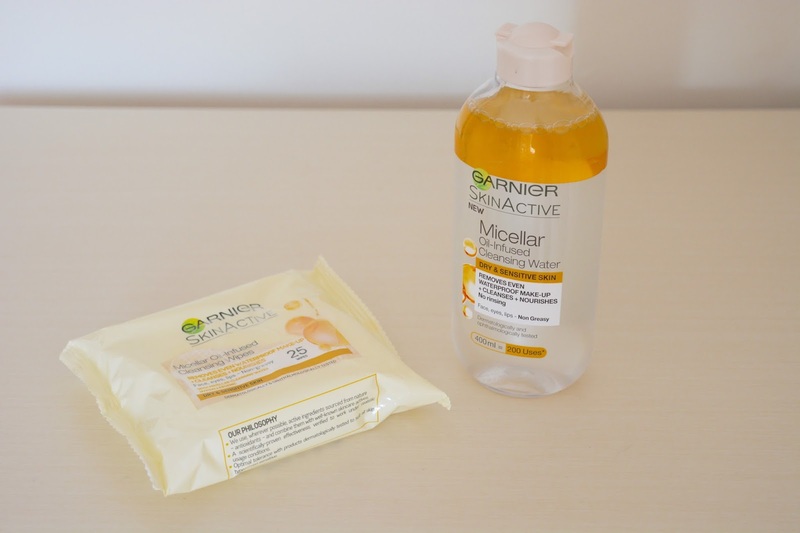 Garnier have done amazing with their new releases and I have been really impressed with the Oil-Infused Micellar products, I am loving the results I have been seeing with my face and it isn't dry in the slightest. I would definitely recommend them and think they work even better when used together, I used the Cleansing Wipes first and then the Cleansing Water. For a truly fresh and cleansed face, this range is fantastic and does wonders for a clear complexion.